It’s often said that Mother Nature’s designs cannot be bettered, and this has certainly proved to be the case when it came to designing the ultimate airborne spy craft. The optical design behind the Eye of Providence is based upon an eagle’s vision – providing a composite view to its operators of a vast area, yet able to focus on a specific location with pin-point accuracy and clarity. Obviously, human nature being what it is, a number of improvements on the typical optical mechanics have been attempted, and in fact have proven to be remarkably effective. The Eye is able to detect an extended range of wavelengths, from low infra-red to high in the ultraviolet. Such a feature circumventing any enemy’s attempt at non exotic forms of camouflage. Thermomasking, even combined with the classified Sloth system (Slow-Level-Operation-Time-Heuristics), is still detectable by the giant eye via its supreme motion detection capabilities: an image fluctuation as low as 0.000000000317% is perceivable in as little as one thousandth of a second across the eye’s full monitored area. The super fidelity image gathered by the Eye requires a full secondary error correction system to provide reliable data. Signals received from the lens are processed by a pair of Balanced-Link Quidnac computers – some of the fastest and most powerful processors available. Hence the term “in the BLink of an Eye” to describe the process of gathering and collating accurate information at unimaginably fast speeds. Four crew members were required to maintain and operate the Eye, but most of the post-processing and usage of the information gathered was performed back at base. Information was sent via Exa-Speed-Photowireless link (commonly termed ESP – references to be obtained) to the vast Quidnac computer bank on the Allies’ main intelligence base. Whilst the power of a single flying Eye was incredible in itself, the technique of flying the aircraft in formation was truly spectacular. The rare occasions that several hundred Eyes were flown together were enough to almost challenge the capabilities of even the great XXLepelin’s Oculus (see reference at end). Named the “All-Seeing Eye of God,” the Eye of Providence was to be the ultimate long-range visual detection unit. 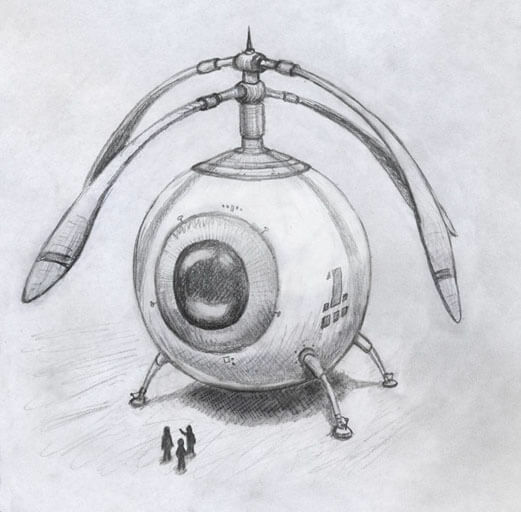 Of course the popular press had to have the last word, and the term “Tele-Copter” or “Sky-Eye” was coined the same day as the Eye was unveiled. As can be seen from the picture, the Eye is conveyed by a pair of counter-rotating propellers, arranged in this configuration in order to counteract the effect of torque. Such a craft tends to be rather slow and not very manoeuvrable, and its deployment had to be well back out of range of any enemy retaliation. Fortunately, the Tele-Copter was so effective that it was able to be used at great distances, and in most cases the enemy was completely unaware of its surveillance until it was much, much too late. one thing that i find curious is that the eye is looking horizontally and not down. perhaps there were different models built that looked down? I think you have spotted the great weakness with the machine. Unless, of course, the sketch simply isn’t very accurate – perhaps the lens had a degree of moveability. I would expect the lens to be movable if the Eye was modelled on a biological one. That would be spooky – imagine that massive eye turning to follow you. Is the Eye perhaps suspendend in fluid, and the vessel is glass? suspended in fluid could be a cool solution, but extremely costly — i still think that the “lower-tech” solution of having one model built that faces horizontally and one model facing down would be much much cheaper to build. You are forgetting something: how do you know that there isn’t a lens on the underside of the sphere already. Maybe one around the back too. It looks to me like there is sufficient ground clearance for a lens at the bottom. Damn, I hate those obvious explanations. I wonder if manufacturing variations caused some lenses to be short- or long-sighted? And if so, is there a “Monocle of Providence” available for myopic Tele-Copters? i feel silly — you are right there is plenty of room for one on the bottom.. perhaps this is even part of the propaganda for the device — it looks like its only meant to scan far away foreign regions but has an auxiliary lens on the bottom.. and i fell for it!